Beautiful and long flowering. Not always long lived but it self sows readily. Best left undisturbed once established. This is a personal favorite that is both easy and beautiful. 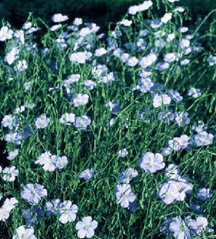 Flax likes full to part sun and is quite drought tolerant. It has a very long bloom period from late spring well into late summer. Masses of tiny blue flowers appear every morning. By afternoon, these will have dropped - new ones will appear the next morning. This is a good choice for rock gardens. It can also be used for naturalizing. Flax resents being disturbed. Division every three years is recommended by some, but because flax will self sow quite readily, I suggest simply allowing a few new seedlings to take off each year to replace older clumps as they die out. The young seedlings are quite easily recognizable and will produce true to the parent.